Engaged Buddhism is a term originally coined by Vietnamese Zen Buddhist teacher Thich Nhat Hanh. 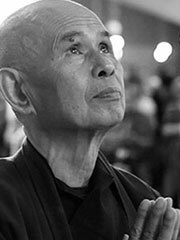 During the Vietnam War, he and his sangha (spiritual community) made efforts to respond to the suffering they saw around them. They saw this work as part of their meditation and mindfulness practice, not apart from it. Since then, the term continues to apply to Buddhists who are seeking ways to apply the insights from meditation practice and dharma teachings to situations of social, political, and economic suffering and injustice. Organizations such as the Buddhist Peace Fellowship and the International Network of Engaged Buddhists are devoted to building the movement of engaged Buddhists. Other engaged Buddhist groups include Peacemaker Circles International, led by Roshi Bernard Glassman. Leaders in the movement include Robert Aitken Roshi, Joanna Macy, Gary Snyder, Alan Senauke, Sulak Sivaraksa, Maha Ghosananda, Diana Winston, and Joan Halifax. Do not think the knowledge you presently possess is changeless, absolute truth. Avoid being narrow-minded and bound to present views. Learn and practice non-attachment from views in order to be open to receive others’ viewpoints. Truth is found in life and not merely in conceptual knowledge. Be ready to learn throughout your entire life and to observe reality in yourself and in the world at all times. Do not mistreat your body. Learn to handle it with respect. Do not look on your body as only an instrument. Preserve vital energies (sexual, breath, spirit) for the realization of the Way. (For brothers and sisters who are not monks and nuns) Sexual expression should not take place without love and commitment. In sexual relationships, be aware of future suffering that may be caused. To preserve the happiness of others, respect the rights and commitments of others. Be fully aware of the responsibility of bringing new lives into the world. Meditate on the world into which you are bringing new beings.